We started with a blank sheet of paper and created something extraordinary. The Spyder is a bold design statement that establishes new standards of versatility while advancing Brinkmann’s commitment to ultimate sonic performance. This daring design accommodates up to FOUR 9”-12” tonearms and allows maximum flexibility of placement regardless of the number of ‘arms installed. Utilizing our heated bearing and bespoke Sinus motor—both Brinkmann exclusives—developed for our flagship Balance, the belt-drive Spyder has benefitted from years of painstaking materials research to yield unmatched musicality. Also pioneered in the Balance, our proprietary, zero-maintenance hydrostatic bearing and our largest solid state power supply (our RöNt II tube supply further elevates performance) endow the Spyder with unrivalled musicality and vanishingly low noise. The 22-lb. alloy/crystal platter ensures speed stability and wide dynamics through the most complex musical passages and prevents dirt and dust from damaging your precious records. 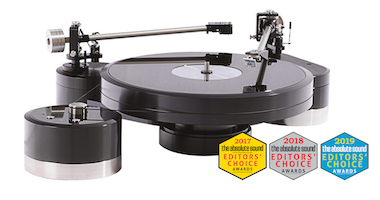 The Spyder offers the precision, wide dynamics and emotional involvement for which Brinkmann ‘tables are renowned in the most versatile turntable design available today.